Every year, at least 1,000 Pakistani girls are forced into Muslim marriages and made to convert to Islam, according to a new report. 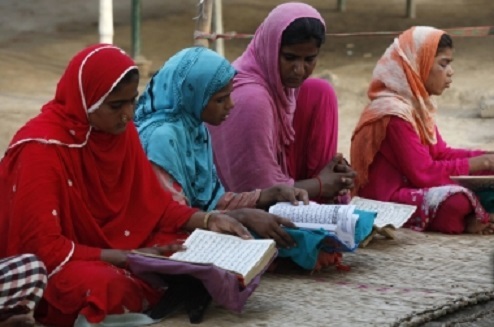 The 'Forced Marriages and Inheritance Deprivation' report from the Karachi-based Aurat Foundation claims that between 100 and 700 Christian girls, and around 300 Hindu girls, are married forcibly each year and forced to convert to Islam. It quotes statistics from the Movement for Solidarity and Peace Pakistan (MSP), which says that an additional 1,791 forced conversions took place between 2000 and 2012. More than 600 of those converted were originally Christians. Director of the Aurat Foundation, Mahnaz Rehman, explained to Fides news agency that forced conversion and marriage is common in Pakistan, but is largely ignored by police and civil authorities. Women face significant discrimination, particularly on a religious basis, she added. Those who are forced to marry are often threatened and pressurised by their husband and his family to declare that their conversion was voluntary, even if the case is taken to court. When MSP first released its statistics last year, its investigation found that forced marriages usually follow a similar pattern: girls, often between the ages of 12 and 25, are abducted, made to convert to Islam, and then married to the abductor or an associate. If a complaint is filed, then "girls are held in custody by the abductors [until the hearing] and suffer all kinds of abuse and violence," the Aurat Foundation states. "These cases are never investigated seriously to shed light on the phenomenon and mechanism of the crime." However, many forced marriages go unreported because "women are considered and treated as repositories of family honour, whose defiance or disobedience is tantamount to public shame and humiliation," and it is also often used as a cover for human trafficking. The US Commission on International Religious Freedom (USCIRF) in May urged the Obama Administration to designate Pakistan a "country of particular concern" and blamed the Pakistani government for failing to provide adequate protection to targeted groups. "Forced conversion of Christian and Hindu girls and young women into Islam and forced marriage remains a systemic problem," its annual report said. Hundreds of Christians and Hindus are estimated to be victimised each year, it added.